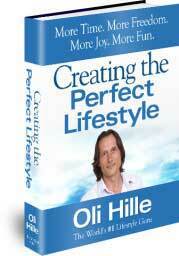 How you can make more money to improve your Lifestyle. The full chapter on More Money will transform your bank balance and your financial opportunities. More Money means more choices, more activities and less stress. Plan everything out at the start. Spend some time at the beginning. Make money for a long period thereafter without putting in any (or very little) time. 1. You decide to buy a rental property. All of the hard work is done at the beginning. You spend some weeks finding the best property, you negotiate, you do the legal stuff, perhaps you do some renovations, find great tenants, draw up the contracts, and then the bulk of the work is done. You then collect the rent. 2. You decide to set up a website with great content for mountain bikers. You do the research on websites, you find great content, you pay someone to build the site for you, you find some advertisers or use Google Ads, and the hard work is done. You then collect the advertising revenue. 3. You act as a connector between two parties who have separate needs. For example you know a paint company that has a large list of old mail contacts they do nothing with. You also know a home insulation company that really wants to increase their marketing in the area. You negotiate separately with each party for the contact list to go to the insulation company. You sign a 20 year agreement that for every sale the insulation company makes, you receive 10% of the profit. The paint company receives 25%, and the installation company gets 65%. It might take you a couple of months to put the deal together but you have just secured a 20 year passive income stream. Setting up an income stream that requires little or no oversight. Entrepreneurs either do something new, or provide a new way of doing something that is already being done. Ignore most of what you have learned from text books and go out and break new ground, and make plenty of mistakes. The more decisive you are and the more mistakes you make, the more you learn and the more successful you will become. I can’t emphasize enough how few people practice this amazing technique. But it is hugely effective! One excellent example is when I applied for some shares in an initial public offering (IPO) through my stock broker. The shares were very “hot” and were expected to stag (open strongly). The shares did in fact do very well, they went up 40% on the day they listed. I made $6,000 on one day. I was very pleased and I rang a top restaurant and paid for a $150 voucher which I then posted to my broker with a thank you note. He had been broking for over ten years and he told me he had never received a gift! Six months later another “hot” IPO came up. Guess who got the highest allocation of shares of all his company’s clients? I did, even though I am a small client. Another example is when a British Head Teacher flew out to interview a number of teachers from my recruitment agency. He interviewed teachers at the local airport because he only had one day in the country. I phoned one of the restaurants at the airport and gave them my credit card number. I said the Head teacher could spend what he liked on dinner, and to give him a nice bottle of wine. I then told the Head Teacher the arrangement. He of course was delighted to have a free dinner during a day of interviews and was happy to take a nice bottle of wine with him. The total bill was less than $100. Soon after, we became that school’s preferred supplier and we earned tens of thousands of dollars in fees from them. I cannot emphasize this tip enough times. Whatever you spend in being generous in business will come back to you tens or hundreds of times over. Of course that is not the main motivation. It is simply being a good human being to be generous to those around you. It also makes the world a better place to live. Try it today! Send your 10 best customers or clients a real gift they will appreciate. Don’t wait for it to be a Christmas gift. Just tell them you appreciate them! This is an amazingly powerful success tip. Successful people help each other to become more successful. Wealthy people help other wealthy people to become wealthier. Fit people help other fit people to get fitter. And so on. If you want to be successful, help other people to become more successful. Don’t charge people, give your advice for free. The reason is simple; those successful people will help you in return. It will also build your reputation and build goodwill around you. There are tons of successful people you can help with your skill base. Let me give you a simple example. Say you have great internet skills. There will be a huge number of leaders or gurus in a field you are passionate about that do not have those skills or the time to learn. If you contact them and offer to set them up on all of the social networking sites for free, and explain the benefits, they are likely to accept and they will then want to help you! If you call them two months later and congratulate them on the new internet presence they have and then ask them if you can interview them for a teleconference, they won’t refuse. You then have something of value you can use to raise your profile and give you social proof.